It is essential that a proper maintenance procedure is implemented after your new carpet has been installed to ensure it keeps its appearance and does not wear prematurely. Use appropriate entrance mats or barrier areas which prevent dirt particles tracking onto your new carpets, causing tracking and soiling. Consider a “no shoes” policy, especially for lighter shades. Carpets should be vacuumed immediately after the carpet is laid to remove loose fluff and fibres.There is a myth that new carpets should not be vacuumed, not only is this nonsense but it can also do untold damage and shorten the life of your carpet. Daily vacumming (even more in very busy areas) will help a carpet look good for much longer and will increase it’s life. Correct daily maintenance will also decrease the need to shampoo the carpet as frequently as many people think necessary. Don’t panic at the amount of fibre removed from the carpet when it is new, this is quite normal and will eventually subside as excess fibres are removed from the pile. Use the correct type of vacuum cleaner for your specific type of carpet, ensure it is in good working order and has enough power, failure to do this can lead to loss of appearance and premature wear. As a general rule loop pile and natural fibre carpets should be vacuumed with a vacuum cleaner without a rotating beater bar or an adjustable model where the beater bar can be raised up so that the rotating brush does not come into contact with the surface of the carpet. Using a beater bar on these type of carpets can cause damage to the surface of the carpet and may cause excessive “pilling” of the carpet. Cut pile carpets should be vacuumed using a cleaner with a beater bar so that the brushes lift the pile each time is is used. There are many branded spot cleaners on the market, these tend to work very well on manmade fibres but some can leave lighter patches especially on wool fibres. For these fibres we would recommend one of the solvent based sprays used for cleaning delicate wool clothing. 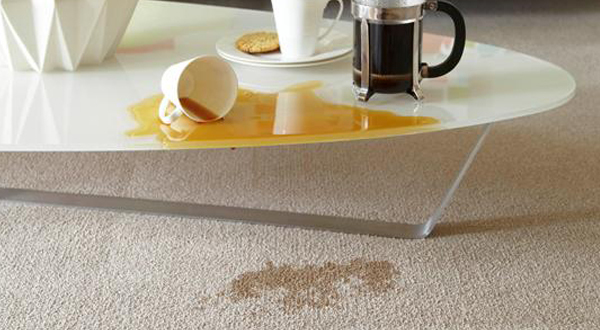 If unsure how to tackle a stain always seek professional advise. We have some tips below that may help. When the inevitable spills and accidents do occur, don’t panic but act quickly. The sooner a spill is tackled, the less chance of a lasting stain. Always blot and never rub a spill. Solids should be scraped up. Apply cleaning agent to a cloth – never directly onto the carpet. Dry a spill with a hair dryer. Your new carpet should be maintained regularly and we suggest you vacuum at least twice a week. We also recommend that cut pile carpets such as velvets and twist piles should be cleaned with an upright vacuum cleaner with a beater bar and brush. Loop pile carpets (ones that replicate the look of coir and sisal) should be vacuumed with a cylinder vacuum using the suction head only. As with any household item, the more you look after your carpet, the longer it will stay looking good. Never use any detergents such as dish washing liquids, soap or other cleaners recommended for general household use. Although they may clean your carpet superficially, they will almost certainly cause problems such as loss of colour and might also harm the pile and/or backing of your carpet. Periodically, your carpet should be given a deep clean and for this it is best to engage the services of a professional carpet and upholstery cleaning company.